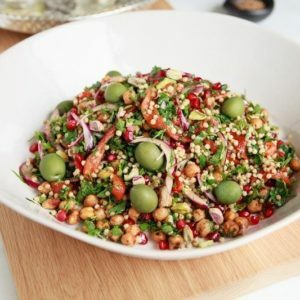 A delicious Chickpea Sorghum Salad filled with fresh herbs and spices. Sorghum is a gluten-free grain hailing from Africa with a lovely mild taste and chewy texture. Packed with B-group vitamins, protein and fibre. I feel like I am running with a theme here, after using that lovely rich pomegranate molasses and lemony sumac in my last post – the Radical Roasted Beet Hummus. 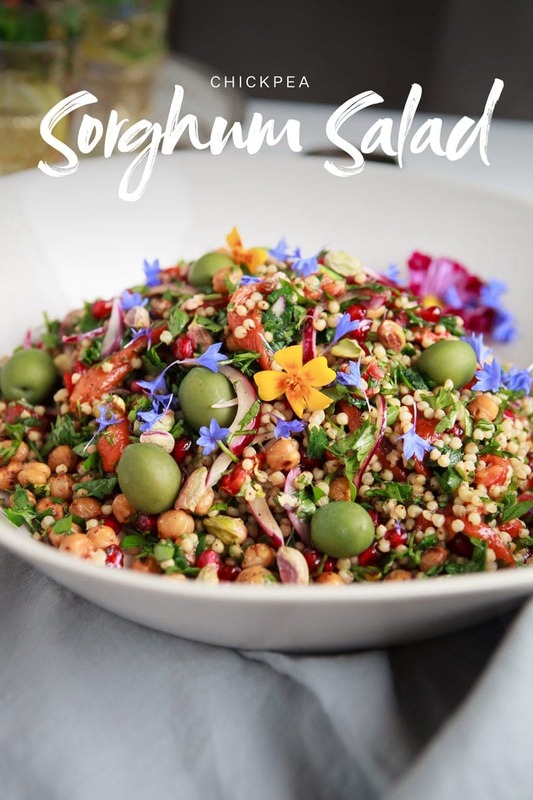 So today’s recipe is a Middle Eastern inspired, flavoursome summer salad – think tabbouli, but with that gorgeous sorghum, and a few added extras – purely to add spectacular colour. 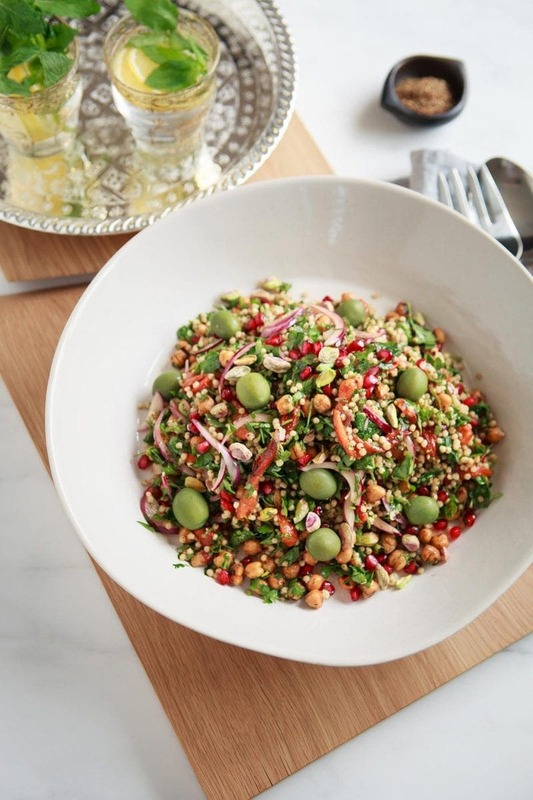 A traditional tabbouli is made with bulgur wheat, finely chopped parsley, mint, tomato, cucumber and onion, tossed in a simple olive oil, lemon and garlic dressing. This salad is only very loosely based on the classic. If you haven’t tried cooking with sorghum yet – then start with this recipe. It is a delightfully chewy gluten-free grain, that makes for a fabulous alternative to bulgur. I often add a protein source to my salads since they make for a more balanced meal. I opted for pre-cooked chickpeas, and decided to toss them liberally in Middle Eastern spices, then toast them up a little in a hot pan. I went for a spice blend called za’atar, which is commonly a mixture of dried thyme, marjoram, oregano and sumac, with sea salt and toasted sesame seeds. 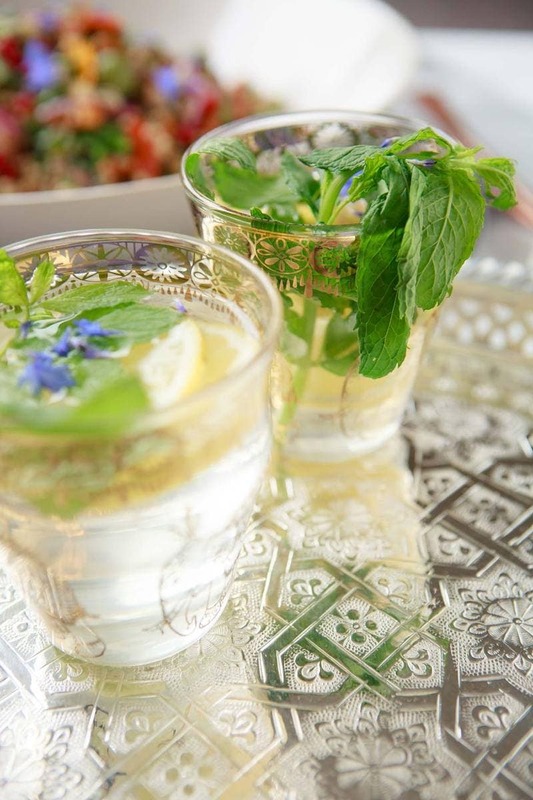 This particular blend is popular in Middle Eastern and North African cuisine. It is used liberally to season freshly baked bread, meat and vegetarian dishes, and has a slightly citrusy, tangy, earthy, nutty flavour. In addition to the za’atar, I added a little ground cumin, paprika and freshly ground black pepper, then drizzled quality olive oil over the top. Although I crisped them up in a frying pan, you could skip this part and just add the spiced chickpeas straight to the salad. If you go for the toasted option, make sure the chickpeas are as dry as humanly possible before you heat them, otherwise they’ll remain soft. 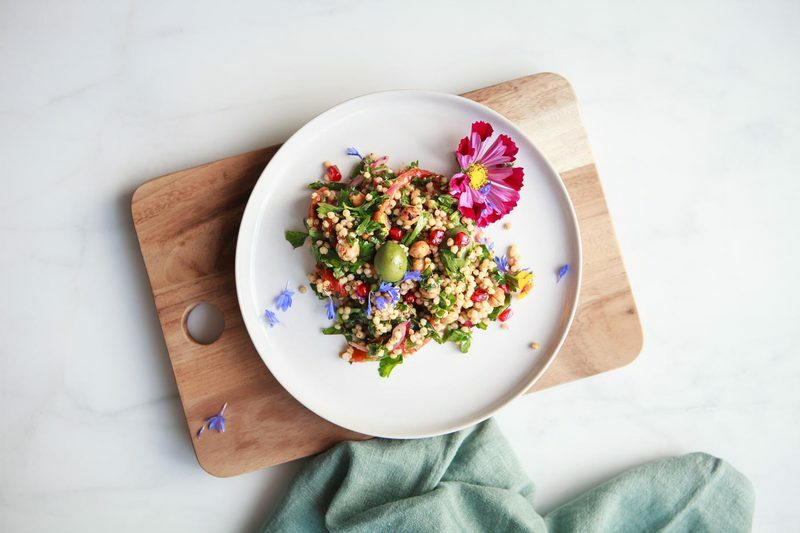 I’m always looking to add colour wherever possible to my meals – because it is in the brightly coloured pigments of plant foods that all those beautiful protective phytochemicals are concentrated. Red onion is fabulous for its anti-inflammatory and anti-allergy compound, quercetin. Pomegranate arils (seeds) are packed full of antioxidants and vitamin C.
The purple-green pigments in pistachios contain anti-inflammatory anthocyanins, chlorophyl and lutein, they’re also rich in the antioxidant vitamin E, B-group vitamins, minerals, and heart-healthy mono-unsaturated fats. Green olives are another antioxidant rich food, and contain the heart-healthy oleic acid. Red capsicums are rich in beta-carotene – a precursor to vitamin A. So much goodness is packed in all that colour! This is a relatively simple salad to prepare. However, sorghum, being a little chewier in texture than other grains, needs a longer cooking time and requires a greater water to grain ratio. I recommend soaking the sorghum in ample water with a splash of apple cider vinegar (or lemon juice), for 24 hours before cooking. The soaking process helps to neutralise the anti-nutrients inherent in the outer bran, whilst the apple cider adds acidity and lowers the pH, helping facilitate the process. As for the rest of the ingredients, there are two slightly more time consuming components. Firstly – the toasted chickpeas – which is totally optional, you can just as easily add them straight to the salad once they’ve been tossed in oil and spice. Secondly, I blackened the capsicum in the oven, then peeled the skin off, removed the seeds and sliced it thin (totally yum). Again, this is optional, but if you’re time-poor, you might want to keep them fresh and raw. 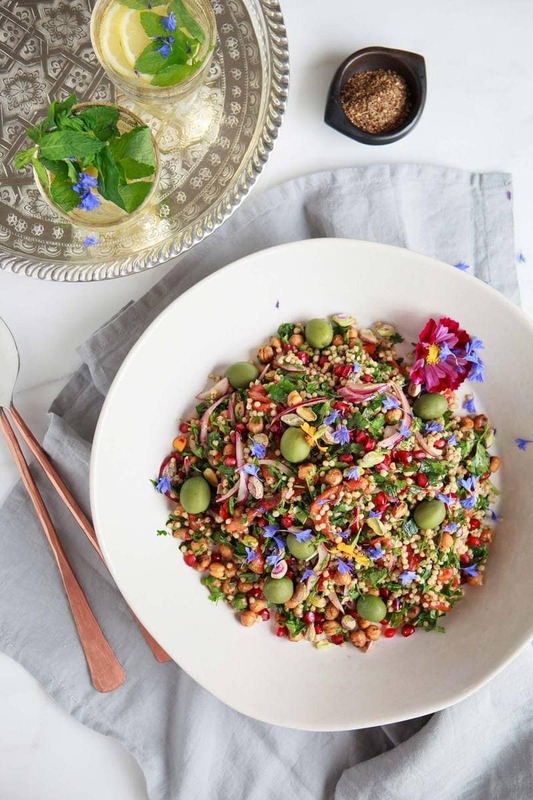 Anyway – just make this your own recipe – there are quite a few elements so you can simplify if you like, and create something more along the lines of a traditional tabbouli. To serve, I had the Radical Roasted Beet Hummus from last week, and a side of crusty gluten free bread. My partner preferred to add a piece of fish. The recipe will make a large salad enough to serve 4-6, it tastes delish the next day. Hope you enjoy! 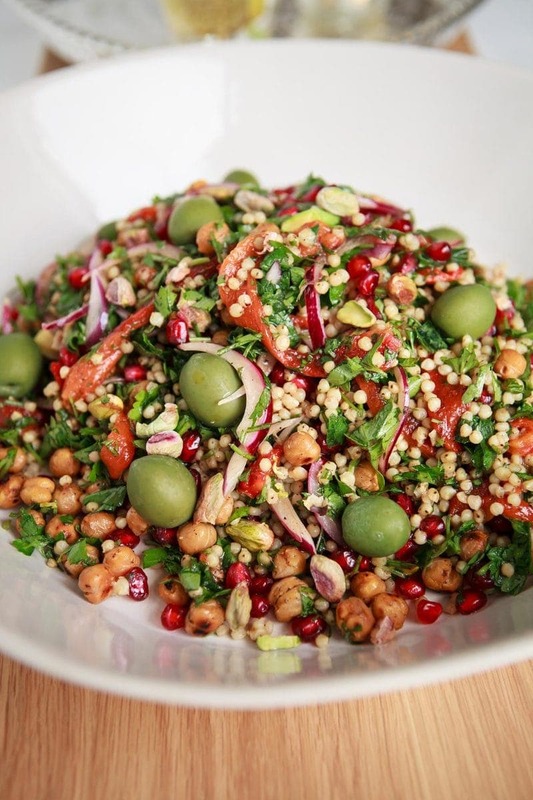 A delicious Middle Eastern inspired salad filled with fresh herbs and spices. Sorghum is a gluten-free grain hailing from Africa with a lovely mild taste and chewy texture. Packed with B-group vitamins. Prep time excludes the overnight soaking of the sorghum. The night before, soak the sorghum grains in ample water with a splash of lemon juice or apple cider vinegar if you have it on hand. When you are ready to cook, rinse and drain well, then add to a pot with 5 cups water (a little vege stock will add extra flavour). Cover, bring to a boil, then reduce to low heat. Cook for 45 minutes, the sorghum should be soft yet slightly chewy. While the sorghum cooks, place whole capsicum in the oven on a high rack, grill at a high temperature, turning with tongs periodically. Once blackened, remove and let cool. Cut them open and de-seed, then slice thinly. An option - simply add raw. To prepare the chickpeas, drain and rinse well, then rub as dry as possible between two paper towels. Place them in a small bowl, add spices, drizzle with oil and toss to coat. If desired, add to a hot pan and cook them till they have popped and are crispy, otherwise add to salad as is. 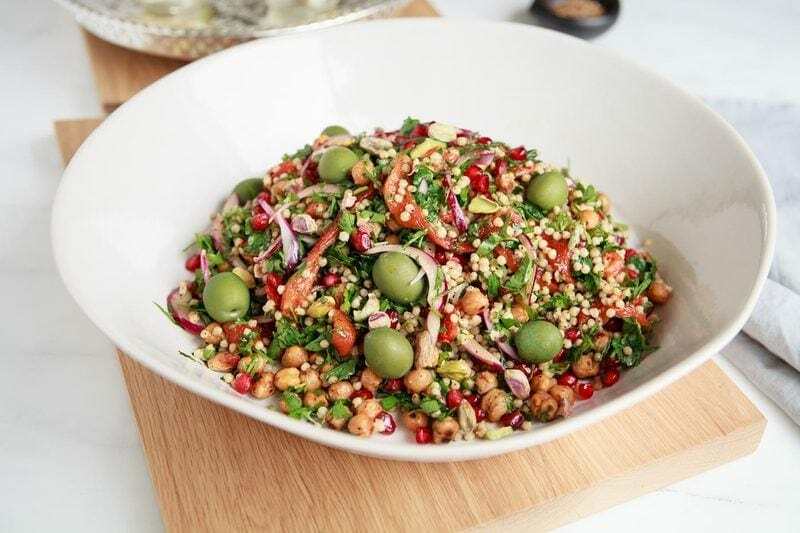 Once sorghum has cooked, add finely chopped parsley and mint, red onion, capsicum, chickpeas, pomegranate, pistachios and olives. Mix well. To make the dressing, combine all ingredients, whisk together, and pour over salad.